The objective of the universal switch rod head, called TPU, is to provide the passage of short-circuit current between the overhead wire and the rail linking cable. Its flexibility enables it to achieve a large contact area with the parts of the overhead wire, even when the telescopic pole is subject to oscillation due to wind, passage of trains, etc. The shape of the switch rod head enables it to be fitted onto cables and tubular sheathing from Ø 10,5 to 49,5 mm, as well as on twin 1500 Volt contact wires. It is simply used by placing it over the cable or tubular sheathing of the overhead wire, which is quick to do and involves no associated actions. Thread is suitable for SNCF insulating poles. It can be used with 40 and 95 sqmm cables. If the braid is subject to a short circuit and damaged, it can easily be replaced using the optional replacement kit, ptnb 82813 (delivered in a box containing 10 kits). The insulated reinforced telescopic pole PITR is used for placing the universal switch rod head on the catenary wire. Telescopic to make easier the transport, it is adjustable by length and can be set to the required hanging high. Insulated to protect the user against induced current and against possible short circuit current during handling. Each part is reinforced to best resist to shocks and the rigidness of the pole permits precise hanging operations. The insulated reinforced telescopic pole is equipped with a wrapping threaded joining extremity, intended to protect the tube end from external shocks and to attach the switch rod head TPU. A reflective band located on the inferior tube make easier the identification of the pole during night works. A system of locking by rotation of the grooved ring enables a fast adjustment of the useful length of the pole. This principle of blocking was studied to resist to shocks and keep its efficiency durably. The 2 meters extension is attached by a threaded ring at the base of the pole. The moveable plug is designed to absorb shocks. Optional: It is possible to adapt a 2 meters extension to reach the highest point of catenary wire. 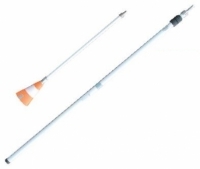 All components of the pole can be dismantled and are available as spare parts. Each element could easily be replaced by the user. The catenary vehicle pole associated to the switch rod head TPU allows the setting of the equipotent bonding between vehicle and catenary in total security. Of 1 meter long, to be used on the catenary vehicle. Insulated, it protects the operator against induced current or against possible short circuit current during handling. The short insulated pole is equipped with a wrapping threaded joining extremity, intended to protect the tube extremity from external shocks and to fix the switch road head TPU. The limit dish device marks the safe distance between user’s hand and catenary wire. The reflective strip allows the pole identification during night works. The shocks absorber handle makes easier handling of the pole. The rail foot clamp MPR, joined to the switch rod head TPU through the cable, is used to establish equipotentiality between catenaries and the rail or any other metallic structure. It permits the passage of low current, strong current, permanent or from short circuits. It is used on all “Vignole” type rail, crossing switches and catenaries supports. 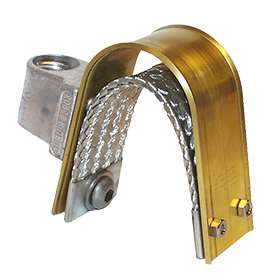 The rail foot clamp MPR is equipped with a diamond brad plate and a support ring, realized in very high resistance steels, which enables the cutting through rail oxide. A tight hand screwing ensures connection even with oxidized rail; none tool is required to operate that tool. The brad plate and the support ring are easy to replace and available in a repair kit. A wear diamond brad gauge is also available. Each connection cable is made of a round copper braid (strand ø 0,2mm) protected by a transparent silicon sheathe and of two reinforced embossed lugs with crimping on insulation and M12 terminal hole. The objective of the universal switch rod head specially adapted for Tramway network, called TPU-Tram, is to provide the passage of short-circuit current between the overhead wire and the rail linking cable. Its flexibility enables to achieve a large contact area with the contact wire, even when the telescopic pole is subject to oscillation. It is simply used by placing it over the cable of the overhead wire, which is quick and involves basic action. The universal switch rod head special for Tramway is equipped with a stainless steel hook, which secures the removing of the upper pole. It also avoids any disengagement of the head during the setting of the bayonet into the cone. Thread is suitable for PIT-Tram Dubuis’ Tramway poles. It can be used for example with 40 and 95 sqmm cables (or other section according to different network). PIT-Tram telescopic insulated pole is especially suitable for use on Tramway network. Made of two parts, it is used for grounding the catenary and the colored cone on the upper tube indicates site of work. Top Part: a one meter tube equipped with a threaded joining extremity and intended to attach the switch rod head TPU-Tram. It is fitted with a reception cone which allows the bottom part to be interlocked. The top part only stays in place on the contact wire for the duration of the works. Then the connection can be unset only by an operator equipped with the lower part of the tramway pole assembly. The telescopic pole use a system of locking by rotation of the grooved ring which enables a fast adjustment of the useful length of the pole. This principle of blocking was studied to resist to shocks and keep its efficiency durably. The tube basis is equipped with a moveable plug, designed to absorb shocks, and which can be replaced by a 2 meters extension (in option) for highest catenary wires. The rail foot clamp MPRG, joined to the tramway switch rod head TPU-Tram through the cable, is used to establish equipotentiality between catenaries and the rail. It permits the passage of low current, high current, permanent or from short circuits. 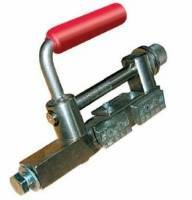 The groove rail foot clamp MPRG is equipped with a diamond brad plate and a toothed screw, realized in very high resistance steels, which enables the cutting through rail oxide. The tightening of the screw with a hex. key ensures connexion even with oxidized rail. This model is especially adapted to groove rail used on the Tramway, notably on rail RI60 and 35GTF. Do not hesitate to contact us for other types of groove rail. Brad plates are easy to replace and available in a repair kit. A wear groove adjustment kit made of 4 pieces of 2mm thickness wedges to place under brad plates is also available as an option. Each connection cable is made of a round copper braid (strand Ø 0,2mm) protected by a transparent silicon insulation and of two reinforced embossed lugs crimped both on cable and insulation and having a M12 terminal hole. Connection cables are available in 25 sqmm, 40 sqmm and 95 sqmm sections, and in 2m, 7m and 10m long. 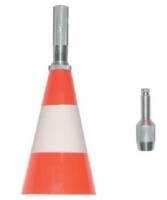 This adapter assembly is made of a reception cone and a bayonet. It allows setting and unsetting of safety line hooks. The reception cone is clipped onto the safety hook. Its flexible plastic ensures a good shocks resistance and its conical form is helpful to guide the assembly pole / bayonet. The bayonet is screwed directly onto the PITR Dubuis’ telescopic pole, in place of the TPU switch rod head. The link between the reception cone and the bayonet is made making a half turn with the pole into the cone. The hook can be set onto the catenary, once the assembly is interlocked. The reflective white band on the reception cone permits the security fastening device to be spotted, even during night works. With this 2 parts concept you need only one assembly pole / bayonet to set and unset several safety line hooks onto the catenary.